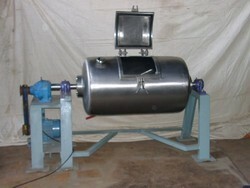 Butter Churner Drum / Cylinder fabricated from 6 mm 304 S.S. Plate with inner side sand blated, Structure made from S.S. rectangle pipe, fitted with 1 HP. Electrical motor with gear box with VFD Drive for speed variation / Control also attached reverse forword & center stopper system with total balanced Churner. We offer wide range of Butter Churners that are used to churn butter in dairy industries and are made of stainless steel. Butter churner offered by us are not only highly advanced but they are very durable as well. They are widely used in industries because of their superior quality.